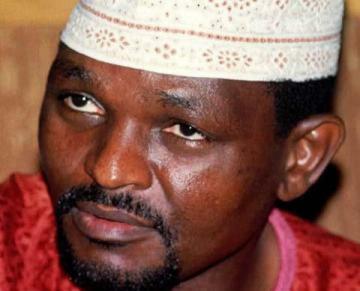 Breaking News;Major Hamza Al-Mustapha (RTD) discharged and Acquitted..
Hamza al-Mustapha was the Chief Security Officer of General Sani Abacha, military head of state of Nigeria from November 1993 to June 1998. After Abacha's death he was arrested and tried for murder and attempted Murder. He has been facing long years of trials and was previously handed a death Sentence. However Appeal Court has dismissed charges of conspiracy to murder Alhaja Kudirat Abiola levelled against Al-Mustapha. The Court ruled that there was no direct circumstantial evidence that he conspired with anyone, as evidence of prosecution witnesses in that regard were contradictory. It held that based on facts and evidence before the court, it is certainly not Al-Mustapha who pulled the trigger and murdered Alhaja Kudirat Abiola. The Court holds that he is liable to be discharged and acquitted. The Appeal Court in Lagos has dismissed charges of conspiracy to murder Alhaja Kudirat Abiola levelled against Major Hamza Al-Mustapha (RTD). The Court in a unanimous decision ruled that there was no direct circumstantial evidence that he conspired with anyone as evidence of prosecution witnesses in that regard were contradictory. Justice Rita Pemu who read the lead judgment held that there was no direct circumstantial evidence that he conspired with anyone as evidence of prosecution witnesses in that regard were contradictory. She further held that based on facts and evidence before the court, it is certainly not Al-Mustapha who pulled the trigger and murdered Alhaja Kudirat Abiola. The Court holds that he is liable to be discharged and acquitted. Justice Amina Augie who is the presiding Judge has just concurred with the lead judgement as read by Justice Rita Pemu. Third Judge, Justice Fatima Akinbami has also agreed with the lead judgement meaning that the ruling is unanimous. The court awaits the judgement on Al-Mustapha’s co-accused, Lateef Shofolahan. The duo of Al-Mustapha and Shofolahan had appealed against the judgment of a Lagos High Court which sentenced them to death for the June 4, 1996 murder of Kudirat Abiola, wife of the deceased winner of the June 12, 1993 presidential election, Chief MKO Abiola. Justice Mojisola Dada of the Lagos High Court had found them guilty of the offence, and accordingly convicted and sentenced them to death by hanging. Counsel to the appellants had however, appealed to the Court of Appeal, 24-hours after the sentence of the convicts. In the notice of appeal, the appellants contend that the death sentence handed by the lower court was unwarranted, unreasonable and a manifest miscarriage of justice.